As I noted, Church documents allowing altar girls do so with evident reluctance, citing two reasons: the 'noble tradition' of the Church on the subject and the importance of male altar service for priestly vocations. Here I deal with the latter issue first, as being the less fundamental. It is nevertheless clearly a matter of considerable concern to successive Prefects of the Congregation for Divine Worship, even when the substantive issue, of the permission for altar girls, has already been conceded. Why are they so worried? LMS Server training in Blackfriars, Oxford. Serving at the altar is an extraordinarily intimate participation in the Holy Sacrifice. If you haven't done it as a child or an adult, you'll have to trust me on this. I served (the Novus Ordo) intermittently as a child, and I've learnt to serve the EF as an adult. In a certain way it makes you a fellow-worker with the priest. You can see and hear more of what is going on, the mechanics of the ceremonies, if you like, and this serves also to emphasis still more the things you still can't see or hear. You get to handle more of the sacred things used on the altar, and this serves to emphasise still more the sacred things you still must not touch. Unless you are completely dead to any sense of the sacred, it is borne in on you how privileged your position is: the position of being a servant of the ceremonies and of the priest. This serves to emphasise still more the privilege of the priesthood: not the privilege of freedom, of any kind of tyranny or creativity, but the privilege of servitude, of serving in the most intimate ways the greatest Lord of them all. In short, service at the altar makes one understand and appreciate the priestly vocation. Altar servers at the St Catherine's Trust Family Retreat. This is so in the context of the Traditional Mass, vastly more than it is with the Novus Ordo. In the EF the server has much more to do, and more to say, and his role is much more important, and much more sharply distinguished from that of the congregation. Nevertheless, it is true in the Novus Ordo as well. It is fitting, natural and inevitable that the service of the altar is a seed-bed of priestly vocations. Those in favour of altar girls may accept this point and say that we can have altar servers of both sexes. Well, at best this cuts the number of boys serving, but in reality the results are more drastic than that. When girls start serving, boys become reluctant to do it. You can see this in many, many parishes around the world, where if care is not taken altar service can become an exclusively female occupation. This is for reasons of male psychology. A great deal has been written about this, so I will direct the reader to other sources and give a very brief summary of what seems to make sense to me. The fundamental issue is that masculinity is made, or achieved, not born. The distinct role of women in society is obviously founded on their reproductive role. Their role in having children is essential, it is long-term, and it is dangerous. For those three reasons they deserve (and need) support and respect. The male role in reproduction is quite different: it is momentary and safe. If men are to be tied in to a useful role in society which entitles them to respect - if they are not simply to muck about - there has got to be something else. They have to be persuaded to take on a male role which, where social and instinctive promptings are working in harmony in a structured way, can commit them to relationships and get them to take on their share of dangerous tasks (for which, after all, they are physically well suited). It is the voluntary taking on of dangerous things which is most obviously masculine trait, and something we see little boys doing to prove their masculinity, to be accepted by their peer group as masculine. This is the basis of practically every play-ground gibe directed at boys you have ever heard. Boys have an in-bred horror of the sissy, the cowardly, and the feminine (as something associated with themselves, that is). They are obliged by enormously powerful instincts and peer pressure to shun these things to establish their masculine credentials. This is perfectly normal and healthy, and while feminists may not like it, it is something we have to live with. It follows that boys are particularly unwilling to do things which make them look foolish or effeminate. Religion can easily be characterised as sissy. If we are not to lose men completely from our congregations, and from the hope of salvation, it is imperative that this perception be combated. Real religion is not sissy, in fact: it is serious, difficult, and dangerous. It is fit for real men to be involved in, and something boys can be proud of associating with. The boy scouts who do the Chartres Pilgrimage can be proud of what they do because of the physical difficulty. 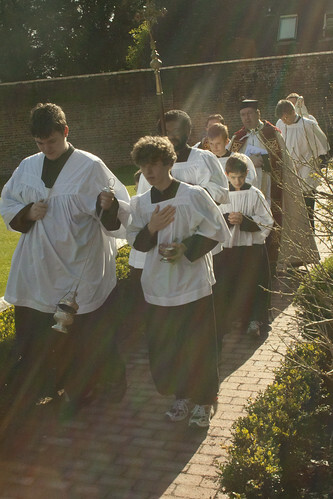 The boys who serve Mass can be proud of that too, because be joining the serving team they are joining an exclusively male group, where they are taught an important, difficult and male role by men. At least, that is true where serving is done by males. This perception of serving is rapidly destroyed by female involvement. Boys of a normal psychological make-up immediately start to feel uneasy about it, and we see a spiral of feminisation. Now this is not a theological issue: it arises out of the contingencies of psychology and social convention. This kind of argument invites the response: 'It should not be so!' Well, too bad, it is so. 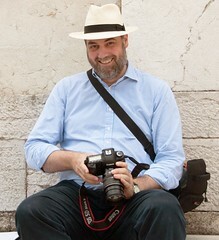 We have to live in the real world; we have to reach people where they are. Here is Michael Voris on the subject of masculinity and Catholicism, and female altar servers. This makes the general point I've been making, and extends it is certain ways. At much greater length, and more profoundly, I recommend a talk given by Dr Leon Podles, author of 'The Church Impotent' on the problem of the feminisation of the Church and the effect this has on male involvement. You can download the MP3 here. Among other things, he points out that the more liberal a Christian church is, the fewer men in the congregation; the Traditional Mass, by contrast, attracts a healthy 50% men. Podles makes an obvious point: men will sometimes die rather than appear unmasculine: indeed, it happens all the time. Do you really think you can make the Church touchy-feely and feminine and still attract them? Podles' book can be viewed online here; this treats the issue historically and theologically; I'm not sure I agree with all of it by any means, but it certainly gives the issue a much wider context. Feminists will hate this argument because they hate gender-specific social roles. This is related to a bigger issue, however: the theological issue, and the small matter of admitting women to priestly ordination. I'll deal with that next. 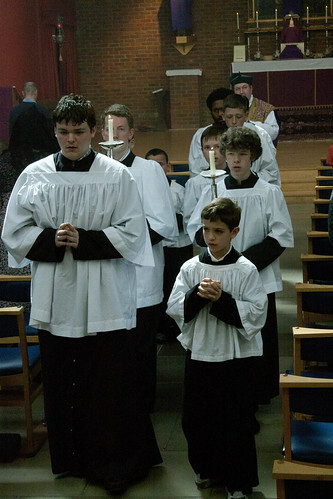 I sometimes wonder whether the priests (especially) who encourage girls to serve at the altar have quite forgotten what it was like to be a small boy - or even not so small.